Telio CS C&B is the chairside component of the Telio system. It is a self-curing, mouldable composite material designed for the fabrication of conventional temporary restorations at the chairside. Telio CS C&B allows high-quality temporary crowns and bridges as well as temporary inlays, onlays and veneers to be created with little effort. The material is characterized by quick and easy handling as well as good mechanical properties and enables natural-looking, esthetic restorations to be fabricated. 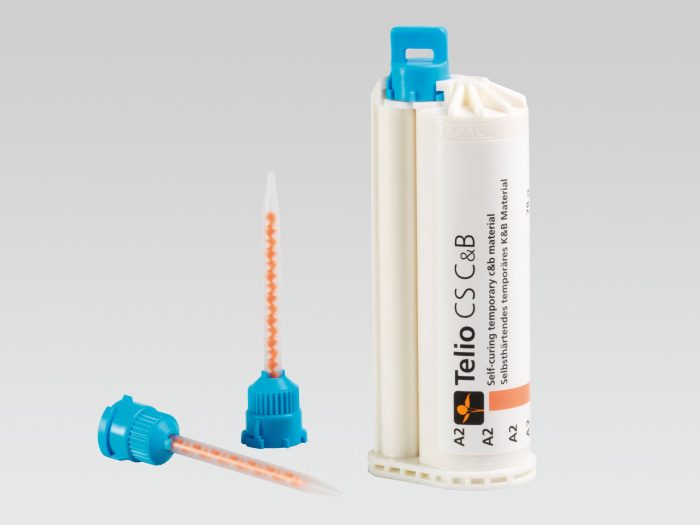 Since it is compatible with the other materials of the Telio range both in terms of chemistry and shade, it is an ideal relining material for temporary restorations made of Telio CAD and/or Telio Lab. In this context, the Telio Chairside or Telio Labside Instructions for Use need to be observed. In addition, Telio CS C&B is suitable for use as a relining material for prefabricated polycarbonate crowns.